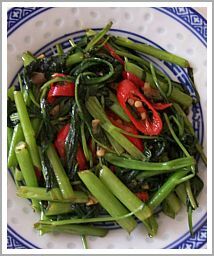 Water Spinach or Kangkung in Indonesian is very tasteful vegetable. In Indonesia this vegetable grows everywhere and they are very cheap to obtain especially on the market, plenty of them. It’s a healthy and nutritious recipe with not too many calories in there, so if you are vegetarian of even veggie, this might be the right recipe for you (don't use belacan or terasi). It’s full of flavor and a very simple dish, and very easy to make. This is also the most common daily dish that you’ll find in almost every single family in Indonesia. You can see it everywhere if you’re on visit at the Indonesian family which will welcome you anytime. As you have already know, Indonesian people are friendly people, you’re really don’t need appointment to visit, and if you’re by accident on visit by dinner time, you might find this stir fry vegetables on the table, and other Indonesian food of course. What I want to say here is that this vegetable is really popular among Indonesian people. In Europe you might find difficulty to find this vegetable on the market. Try it at the Chinese supermarket. They are plenty of them; it’s just a little bit expensive. Very different than Indonesia, in Europe this becomes the most expensive vegetable that you will obtain. Heat the oil in the pan and fry shallots and garlic until fragrant. Add Red chilies, galangal, bay leaf, terasi, some sugar, salt and tomatoes. Add kangkung and stir fry until limp.